What a festive map that will end up being! You’ll need to be sure and include a photograph of the finished product…well, as finished as it will get, as genealogy research is never truly done. 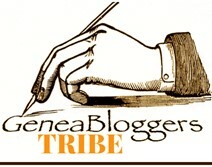 I found your blog today, thanks to a mention in GeneaBloggers this morning. My eye caught the surname SHIELDS in the listing of those lines you are researching. I am working on a Shields line right now, myself. Of course, the possibility of a connection is rather slim, but it’s nice to run across someone else working on similar lines. Great to hear from you, Jacqi. In my tree, Elizabeth Shields, abt. 1788 in GA, is my 4th great grandmother. Her daughter Nancy Cunningham, 1807 Knox Co., IN is the mother of Margaret Thompson, 1834 IN, who was the mother of Ada Ann Thompson, 1861, IN, who was the mother of my grandfather Charles L. Beauchamp, 1881, Knox Co., IN, who was in turn father to my mother, Otha Beauchamp Reed, 1916, Pulaski Co., AR. Not sure if our lines intersect, but am always happy to help fellow researchers when they do or when their family trees have roots in the north Texas area. I’m beginning something of the sort as a road map for an upcoming visit to Scotland. I’ve been mapping the addresses of one group of ancestors from records, and plan to visit all those addresses. Luckily, being Scotland, many of the places still exist (although I’ve found at least one address that’s now under a motorway or bypass). I even recognise some from my own time living in the UK. I’m going to take LOTS of photos.